Hello. This is my final post for The Pink Elephant. It's been a fun 2 terms and I've learned a lot about digital scrapbooking in the process. I do hope to continue to share pages with you in the near future. My mother re-married last year after being a widow for 17 years. I'm not very happy about this because it also meant my mom moving away from me and the kids to Louisiana. But she is happy and that's truly all that matters. That's what we want for those that we love. This page was created with one of their wedding photos that I took. 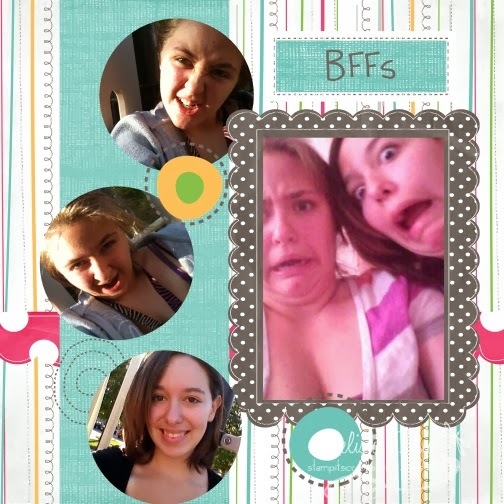 I grabbed a freebie Quick Page from My Memories Suite store and dropped in their photo. Quick and simple! I chose a beach theme because they were married in Florida, although, I look at this element and see mostly flowers. It's pretty. A huge thanks to Lori and Sheri for allowing me to be on this fabulous team! Good Morning! Super quick post today. I'm spending the day with my sister today - I think we're going to hit a couple of yarn stores and who knows what else. It's going to be a great day. I have some news that I've been waiting until the right moment to share. I am on the design team for The Stamp Doctor. This is the only way I'll ever be an EMT! Haha!! The Stamp Doctor has some super fantastic clear stamps, exclusive dies manufactured by Spellbinders as well as Spellbinders dies and lots of other fun things that is sure to get your pulse racing. So today is my first share and I am so excited. I did use the challenge at CAS-ual Fridays to help me a little. I love how this CAS card turned out. My card features stamps found in the Autumn section of the stamps, an M-Bossabilities embossing template and ivory card stock. It's a pretty simple card and I just love the punch of color. Please stop by the store, or the blog, or even the Facebook page. Hi y'all! Happy Thursday. I'm keeping my post real short and sweet here. I am in for a busy day. First a run to the doctor's office with my youngest son. He's gotta have blood drawn. Then we'll stop for a quick breakfast and off to school. Then I rush home to get logged on for work. I'll work about 6 hours and then my sister will be here! I am so excited that I get to spend my sister's birthday with her. So, I've featured this pumpkin before, but before it had a cute image in front of it. So this time, the pumpkin gets to be the star. So easy to make, too. First off I printed 3 colors from the Simply Fall digi paper pack. Cut out 3 ovals and layered to make the pumpkin. And then using an old SU! label punch, I made the stem. 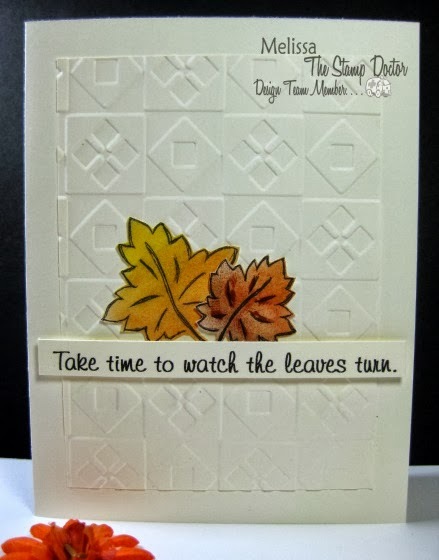 I used Spellbinders Foliage dies for the leaves, inked all the edges and here you go! Finished it off with a sentiment from Fall Sentiments. Easy peasy. Hello! Happy Tuesday! I'm going to keep my post short and sweet - oh so very sweet. This week's sketch is up at TMS and we're sponsored by Stamp Fairy. I created this card.... *squeal* - I lovey these images. So the card was created from a card kit from Angela. I swear, I think 80% of card kits that I have stashed are from friend and DT Member Angela. She certainly knows how to create fab kits!!! 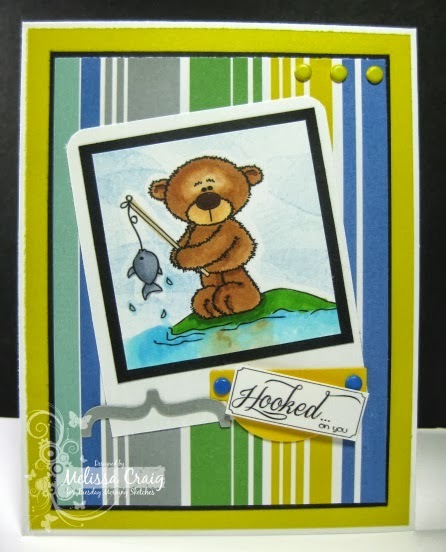 I am featuring Barry Fishing and a freebie sentiment. So cute! It worked so well with the kit Angela put together, don't you think? I love that it looks almost like a real Polaroid. I hope to see you play with us - you could be featured on our Facebook page! Good Morning! It's Monday and that means there's another great challenge up at The Pink Elephant. I also want to make you aware that they are having a DT call. This has been the greatest team to be on. The end of the month is the end of my term and I have certainly enjoyed being a part of it. So this is my daughter and her best friend Taylor. Their wacky photos mixed in well with the fun of stripes and polka dots! I love these pictures of the girls. They sort of remind me of my best friend Kensey and I when we were this age. Have a great Monday and we'll see at TPE! Hello everyone! I hope you're having a great weekend, there's not that much left of it. It's been enjoyable and busy here. Hollyanne had Homecoming festivities Thursday, Friday and Saturday so that means Mom's taxi cab was working over time. I did manage to get a little time of crafting and crocheting in, but I think I need another weekend. 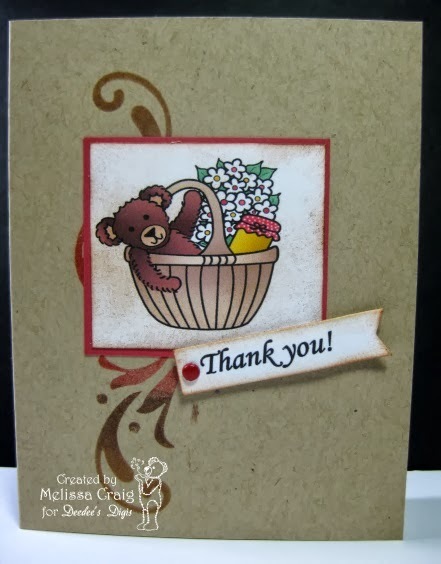 So here's a card that I made featuring Basket of Love digital stamp set by Deedee's Digis. I used the pre-colored image that comes in the set - these make for very quick cards. I did use the color theme from Just Us Girls (I haven't played along with their challenge in sooooo long!) and the sketch is from Unscripted Sketches. I kept it very clean and simple. 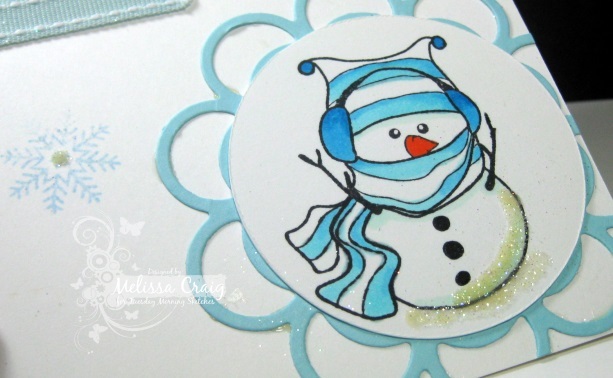 I love Kraft cards, it took me a long time to get to that point and now I can't get enough! Like I said, it's clean and simple and it says just what I need it to. Have a super Sunday night. I think I'm going to work on a couple more rows of the blanket while sipping a glass of Moscato and get my head ready to go back to the office tomorrow. I worked from home all week this past week. I wish I could do that for always! Good Morning! I hope you week is going well for you. Mine hasn't been too bad. Now when I hear those two words, my mind immediately goes to work on a baby card. This week was no different. I loved the release from a couple of months ago, the Jubbly animals and I've been itching to get my hands on that sweet giraffe. 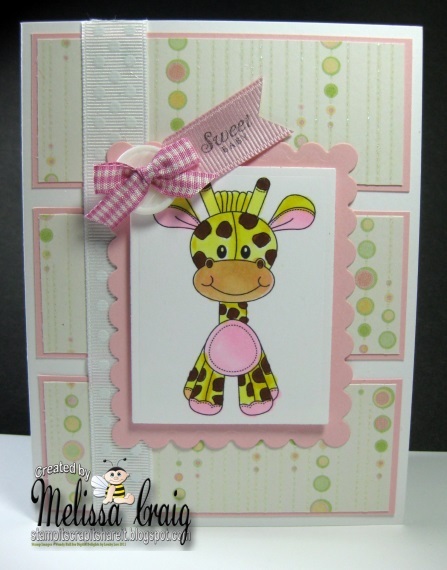 Here is my card featuring Jubbly Giraffe. I did use this week's sketch from Tuesday Morning Sketches, just turned on it's side I love the soft colors and just look at the adorable giraffe! I do hope you'll join us this week. Come on, everyone uses buttons and bows on their cards. You might just fit in without even realizing it! Good Morning Everyone! I'm going to keep my post short and sweet today. The new sketch is up at Tuesday Morning Sketches and it's a lot of fun. This week were sponsored by Raisin Boat, one of my favorite stamp places. You've heard me call it the Netflix of the stamping world. Kim and Bobbi are wonderful and they offer excellent customer service. I used Curly Cute, Awesome and Riverwalk Floral. I also used one of the Raisin Boat Keepers Smooth as Silk ribbon assortment. I don't do bright colors very well, but this card has happy all over it. 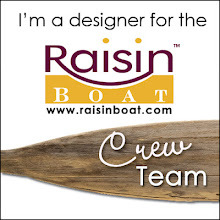 The card stock I used is also Raisin Boats exclusive card stock - Brighton Beach White, Lemon Glaze and Summer Lime. So head on over to TMS to join us! Hello - it's me again. 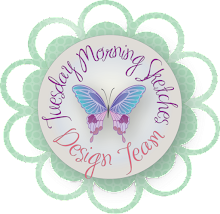 Now I'm here to share this week's project for this week's challenge from The Pink Elephant. This is a super fun and easy one! All of the elements are not in the My Memories Suite software. I used a fabulous digital kit that I scored at A Cherry on Top a long time ago. I am so thrilled I can use everything that I have with this software and it looks fabulous. 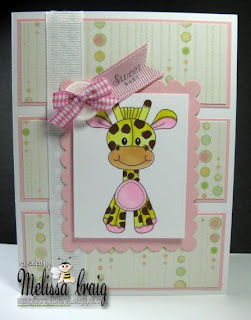 Now head on over to The Pink Elephant to see more fun projects and to play along with us. Good Morning! 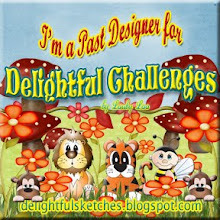 Yep, I am hosting today for you at Digital Delights by Looby Lou. I am so excited about this post because I love love love what I made to share with you today. It took me an entire afternoon, but I am so pleased with the results. 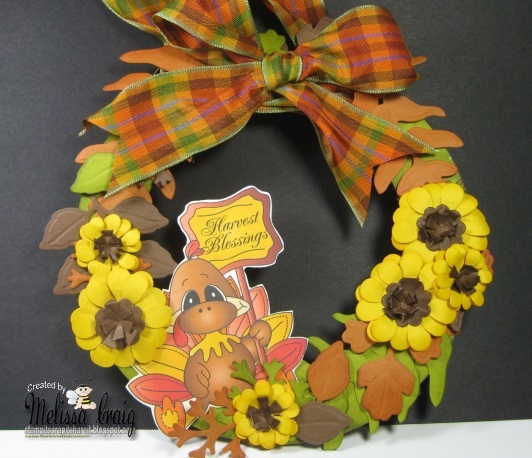 I made an Autumn Wreath featuring Tiny the Turkey. So here's the wreath up close. I made every part of this wreath. I began with cutting out a large circle from chipboard and then cutting out the center. Then I covered it with green card stock. While that was drying my Cuttlebug and I went to work cutting out leaves. 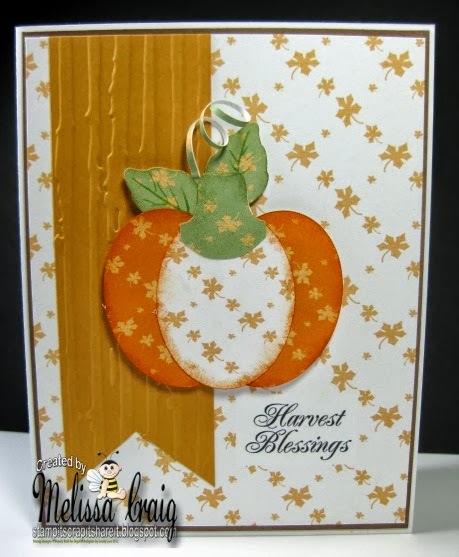 I used Spellbinder Foliage dies and moss, rust and brown card stock. Then I inked up each one to add a bit of shading and richness. You all remember when Cuttlebug first came out on the market and we were all excited about getting everything Cuttlebug we could get our hands on? Yeah, well, I have some dies that I simply had to have but didn't know how to think dimensionally with them so they stayed in a box. I know more now, so I pulled those out and went to work on creating Brown-eyed Susans. (I know they're called Black-eyed Susans but that's so dumb, their centers are brown - not black!) They are created from two types of flowers, ones with rounded petals and another with squared petals. They're cute aren't they?! Then I printed Tiny the Turkey (colored) on ivory card stock and then glued it to another piece of card stock. I wanted him to be very sturdy. Oh, before I did that, I did use the .png format of the sentiment so it can layer on the sign. After the glue dried, I cut the image out and glued him onto the project. All that was needed was some pretty ribbon and a bow. And voila! 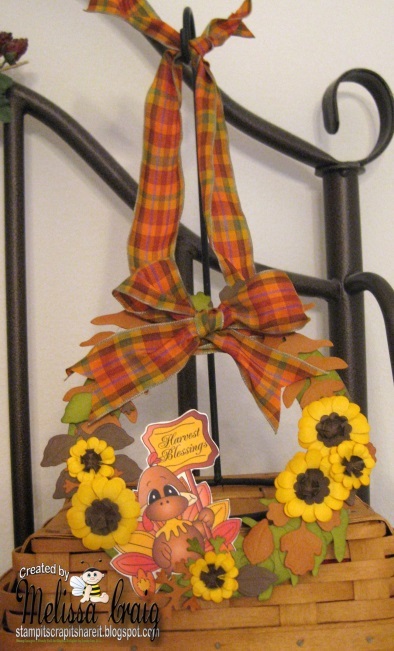 I have a sweet little Fall Wreath to hang on a door or a small wall. I am pretty happy with this project. I hope it inspires you to start decorating for this time of year. This is the only way I get the colors of Fall - we don't see much color in Florida. Good Morning! This week is going by fast! I'm nearly done with the baby blanket - whoo-hoo. But then I'll be working on another one for a Christmas gift. Now this could be new baby, new house, new car, new job, new marriage or divorce, whatever lights you up. I went with Baby's 1st Christmas featuring Baby Snow and Candy Cane Sign Post. Baby Snow is one of my favorite images and I love the sign post because you can customize it to say whatever you need it to. So easy to do in your word program. Just insert the photo onto a word doc and resize to your needs. Then add a couple of text boxes, type your message and fit them into the image. I followed a sketch, but I now don't remember which one it is. I hope you enjoy the card and join us for the challenge. Have a super great day! Good Morning! Happy Tuesday! It's time for a new sketch at Tuesday Morning Sketches and this one was created by Jessi. 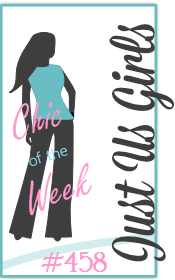 It can be clean and simple or really dressed up - you might want to go to the dressy side because it's also the Judged Challenge week which means we have an added twist. This week we're Making it Shine (bling or glitter). Our sponsor this week is Yours or Mine Paper Crafts. A great little internet store to stock up on your favorite stamps and products. 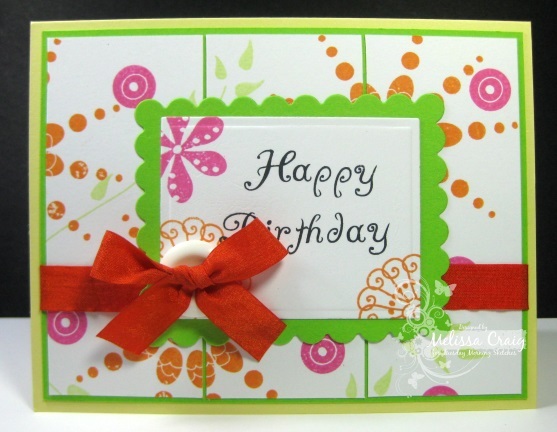 So I created my card using one of my favorite stamp sets from The Greeting Farm. Yours or Mine Paper Crafts carries a wonderful selection of TGF stamps. I added only a touch of glitter for the snow. I do hope I'll see you over at TMS to play along with us. The prize is $10 voucher to the Yours or Mine Paper Crafts store - but if you want to place an order Mei has graciously extended a 20% discount! This one was a challenge for me as I'm not a nautical kind of girl, so pictures weren't happening. So, I've been thinking about my Mom a lot lately and really wishing she was still 10 minutes away. She lived in an apartment complex that was right across the street from Lake Monroe. A little further down that road you can see all kinds of beautiful boats docked in the marina. 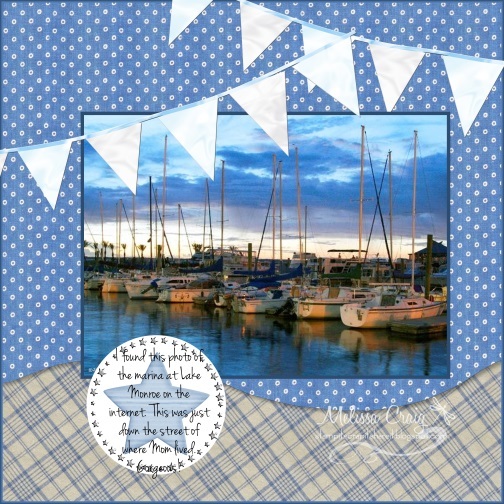 So I found a gorgeous picture of the marina on the internet and created my page. Isn't that lovely! I think I need to go one evening when it turns chilly (no mosquitoes) so I can see this sight for myself. My page is rather simple, but simple is good. Have a great Monday and we'll see you at The Pink Elephant. Hello. I am at a late start today. Stayed up last night until 1:30 watching a movie. So I slept in way late which I'll regret when evening comes again and so quickly. Anyway, I have fun project to share with you today, I created a page using Deedee's Digis. I wanted to show you how easy it is to use "outside" products from what comes in My Memories Suite. 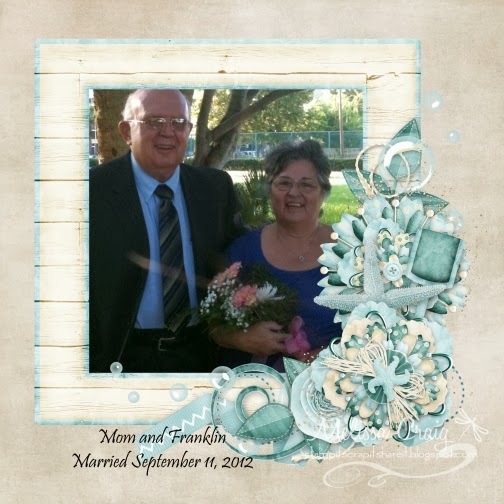 I love this program and I love that Deedee's sets come with colored images, so it is so easy to incorporate into your My Memories Suite scrapbooking projects. I am featuring an image from the Country Christmas set. Isn't that angel adorable? She reminds me of an ornament that Hollyanne has that is made out of cinnamon clay. Anyway, I love that some of Deedee's Digis sets come with digital papers, too, because then you can create a coordinating page in a snap. Well, I hope you enjoy your page and it inspires you to try something that maybe you haven't thought of before. Have a great Sunday. I created my own pillow box. OK - so this was way too simple. I found a template online and printed on the back of some heavy decorative paper. Cut it out, scored it, glued it, decorated and VOILA! Stuff it with some treats and you've got a fun Halloween treat. Great for a party favor. My project features Spookily Night. I did print it twice and cut the owl body to add dimension. So easy, so cute! Now head on over to the challenge and play along. And you might as well snag a couple of the new digis! Hi! So you know how I don't usually watch TV. Well, I still don't with the exception of a few shows. The one I watched is over now, so no need to be stuck in front of the TV. It's also a huge waste of time. Anyway, so I came in room tonight and played Candy Crush, lost 5 lives in about 5 minutes. Play Farm something, lost 5 lives in about 10 minutes. I did some comments on a few blogs... what was next? So I played. I created this CAS card for two challenges. 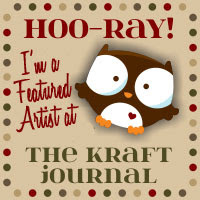 The Kraft Journal (I know this one fits the CAS definition) and CAS-ual Friday. For the life me, I couldn't get the lighting right and after so many tries I took the one that could before the camera battery died. It's still too dark for my liking - but it's OK. You can see the tone on tone Kraft a little easier. Good Morning. It's Tuesday and usually I'm pretty excited about today and I am but I'm sad too because the holiday weekend was fabulous for me. I crafted the entire weekend. I didn't make much headway on the baby blanket, but I made several projects to share with you this month so that's a good thing. I am so thrilled with this card! You all know how much I love flowers and I love making them, too. I guess I can share this since it never happened. I applied and was accepted to the McGill Punches design team and then it never happened. The person who was in-charge stepped down and I never heard from the person that took over. Oh well. Creativity goes on. I created this flower using Spellbinders Foliage Shapeabilities. Yep, even the flower was created with what's intended to be a leaf. 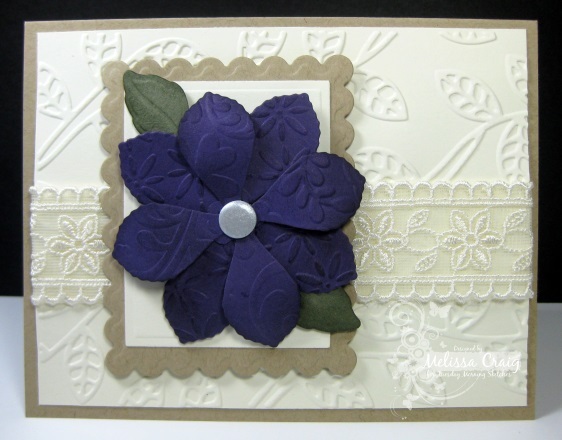 I cut out the leaves, ahem, petals out of Elegant Eggplant card stock and then embossed 4 petals with Fancy Florals embossing folder and the other 4 petals with Baby's Breath embossing folder. I inked them a bit to give a bit of richness and depth. I couldn't find an interested button or brad to go in the center but I found these faux brads in one of the drawers and used it. Then I embossed a vanilla panel with Vines embossing folder by Paper Studio. I think it turned out absolutely gorgeous! I hope you like it, too. 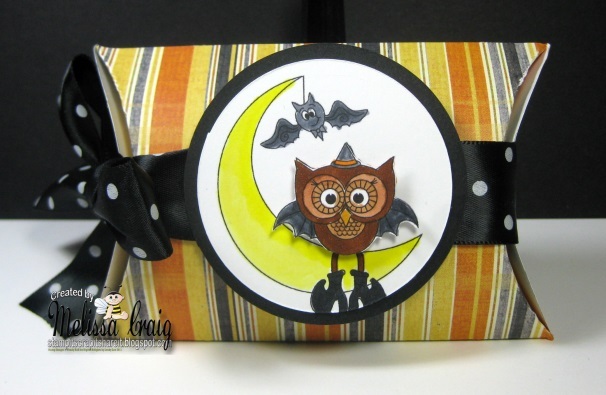 I'm going to link it this one to The Kraft Journal's CAS challenge. I think it fits. If not, that's OK, too. See you over at TMS. This week's challenge at The Pink Elephant is a fun one. 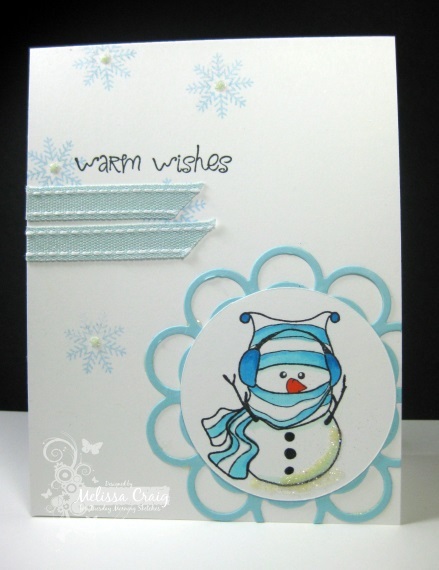 Use numbers on your card, project or scrapbook page. Before I show you my page, I have to tell you that I've created all my pages for this month's challenges and I can't wait to share them all with you. I'm wishing my life away, I know, but I am so happy with them! OK - this challenge, I created a Christmas page. I can't even remember where I found the inspirational sketch I used to create the layout. I do remember is for a SU! demo of course using SU! digital scrapbooking software. I don't know how much that software is, but I'm sure you can't get it with a $10 off coupon like you can My Memories Suite. Use my code in the upper right hand corner of my blog and you're on your way to saving some serious money! 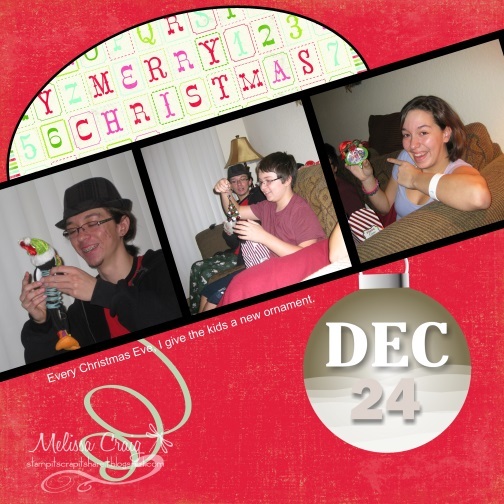 Now for my page, these are my kids last year opening up their ornaments. I give them one every year. Sometimes I make them, sometimes I buy what I think is fun and sometimes (most of the time) I make sure they capture what happened that year. This particular year my boys got the fun but my daughter got the handmade-what means so much her-ornament. I painted a ceramic ornament that I got at Michaels for $0.50 and then put a picture of the boys from One Direction on it. See her face? I guarantee it's not for my efforts, that excitement is strictly for Zayn, Liam, Niall, Harry and Louis. Good Morning! I hope everyone is enjoying their long weekend. Yesterday I spent some of creating digi scrapbook pages that I'll be sharing with you this month. I also took my daughter to see the One Direction This is Us movie. It's not really a movie, more of a documentary on these very talented, very handsome young men. I have been dubbed as Mama Directioner. LOL I like their music, it's fun. So I have a card to share with you that I created using Beauty of the Season. I did use the colored image that comes in the set as well as one of the sentiments (not pictured). It says "Merry Christmas" on the inside. I created this card using a sketch from The Sweet Stop, removing a couple of the elements. 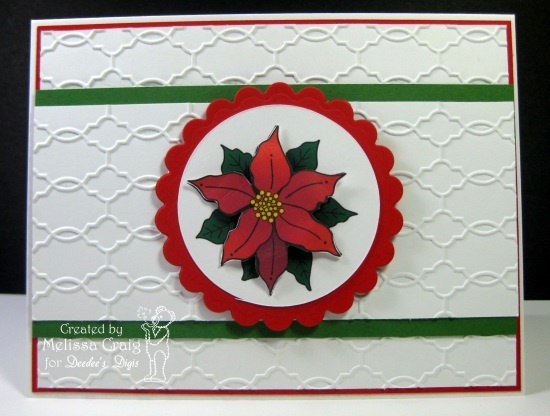 I love the simplicity of the card allowing the beautiful poinsettia standing out and only adding embossing for texture. I did print the image twice, cutting out one to layer on top of the other for more dimension. I hope you enjoy this card and that it inspires your creativity.